John Taylor in Favor of Higher Marginal Income Tax Rates? If Not, Why Not? A couple of weeks ago, John Taylor posted a graph showing that since 1990, there has been a negative correlation between the Investment to GDP ratio and unemployment. There’s been some back and forth between Taylor and some of the other big boys (some of it summarized at Mark Thoma’s Economists View, and even Krugman has weighed in). Lots of fun is being had by all, but it seems everyone, especially John Taylor, is missing a key point. If, as he states in his post, “the most effective way to reduce unemployment is to raise investment as a share of GDP” and if we want to reduce unemployment, then we should be raising the top marginal tax rate.. After all, going back to 1929 (that’s as far back as the Bureau of Economic Analysis has data), there’s a quadratic relationship between the top marginal income tax rate and the ratio of private investment to private consumption. correlation between the top marginal tax rate the ratio of investment to consumption for top marginal tax rates below 50% is 55%. That is to say, an increase in tax rates increases the ratio of investment to consumption when tax rates are below 50%. So… raise top marginal rate —> more investment —> lower unemployment. I imagine John Taylor’s endorsement of higher marginal tax rates should come any moment now. Tax Rates v. Real GDP Growth Rates, a Scatter PlotCross posted at the Presimetrics blog. This post was submitted by Kaleberg. In this post, I will look at the relationship between top marginal income tax rates and real GDP growth using a scatter plot. The vertical axis is the GDP growth rate, the geometric average for multiple years. The horizontal average is the top marginal tax rate. The one year comparison is shown in dark blue, and each subsequent year is shown with a paler color and a smaller marker. Lower top marginal tax rates seem to limit economic growth with a rate of about 60% seeming to divide the restricted growth phase from the unrestricted growth phase. There might be a little falloff when the tax rate passes 90%, or there might not. There are lackluster growth rates associated with higher and lower top marginal tax rates. Mediocre growth is not all that hard to achieve. Finally, if high top marginal tax rates had a multi-year effect, we’d see a distinctive pattern in paler blue in this chart, but we don’t. The paler blue, longer term comparisons seem bounded by the single year effect. The data used in this scatterplot is the same data used to build the bar chart in this this post. I present an update on aggregate demand using the highest frequency of economic data available, US Treasury tax receipts. Tax receipts serve as a proxy for nominal aggregate demand via a nominal indicator of private payroll growth. US daily Treasury tax receipts are improving. (This chart has been modified since its original posting to enable reader to click to enlarge). The chart illustrates the federal deposits of income and employment taxes that are recorded on a daily basis and presented here as the annual pace of the 30-day rolling sum. The red line illustrates the average annual growth rate spanning the period 2005-current. Since roughly April of 2010, the annual pace of income and employment tax receipts has been above the average, 2.8%. In the third quarter, the annual pace of income and employment tax receipts remained around 4%, consistent with the second quarter pace. Hours and employment are improving, supporting wage gains and higher tax receipts. But more importantly, the pace of tax receipt growth has not faltered, demonstrating ongoing recovery in the labor market and consumer demand. But it’s not enough. The gains in tax receipts are likely a function of firms adding back hours instead of pumping up the work force. (see my previous post with links on the “hourless recovery“). The chart above illustrates the cyclical loss from recession and gains during the recovery of private net-jobs (payroll) and aggregate weekly hours (you can see the summary data from the September payroll report here). Both series found a trough in the third quarter of 2009, which is consistent with the bottom in tax receipt growth (chart above). However, the hours index has recovered quicker than has its payroll counterpart (of course it fell farther, too). To date, both private hours and payroll are 7% short of their values at the peak of the economic cycle. Receipts are growing, but not vigorously enough to indicate any shift in the current trajectory of payroll growth. Therefore, nominal aggregate demand remains weak. Furthermore, the still-nascent household deleveraging cycle is very likely moving at snail-speed (see this article for a discussion of the link between consumption growth, income growth, and deleveraging for today’s commentary). In my view you can boil Supply Side down to a simple aphorism: “If you tax something, people will use less of it”. And all things being equal and depending on how you define ‘something’ this seems economically and psychologically plausible, higher prices drive down demand. Unfortunately in the real world all things are not equal and many different incentives bear on demand, meaning we need to take a deeper look. In Supply Side theory income tax is a tax on work and so serves to have workers do less of it with the easy corollary of less tax, more work, Tax Cut = Increased Productivity. Well I’ll let Spencer and Cactus do the heavy lifting and correlation, I suggest instead that Supply Side is simply caught up in a simple conceptual confusion. In reality America doesn’t tax work either in its scientific or more normal sense, we don’t tax people at X pennies/Joule, instead we tax consumption or income or property, none of which have any necessary connection to actual amounts of work or for that matter skill, a Trust Fund Baby gains income and consumes things based on income and capital accumulation done by other people. So if the income tax doesn’t tax work, what does it tax? And what are the logical consequences of that? For an impressionistic answer follow me below the fold. Now the ‘well duh’ answer it clear, an income tax taxes income, and so reduces people’s use of it in favor of the state. But this model while reasonable enough to explain early medieval taxation where tax, tithes and rent were all largely composed of slices taken off the top of income/productivity. later medieval and then modern taxation started building in controls that set taxation levels based on how total income was used and so taxation began to break down into two more distinct categories. One category was a tax on property, which could include real or personal property, together or separate. This is a tax on past consumption. The second category is a tax on current consumption. And this is what puts the pseudo in supply side psychology. Its governing assumption, which is buried so deep as to be invisible to those trapped by it, that the goal of work is accumulation rather than consumption. In this world-view the governing rule is ROI. But I suggest that historically this hasn’t been the rule at all, humans didn’t come down from the trees with ledger books under our arms, instead humans target levels of consumption and just as importantly the leisure with which to do it. As I note time and again, I am not an economist and as such not bound by any particular theory, nor by any supposed ‘truth’ of a given ‘Law’, instead my training was in history which for this purpose can be defined as the study of what actually happened. And if you examine world history you see that past civilizations mostly valued the concepts of display and largesse, both mythically and practically the role of the King was to bring peace and abundance, which is to say the possibility for consumption and the leisure to enjoy it. And nobody liked a stingy and miserly King, King Midas was not a sympathetic character. Nor for that matter was simple accumulation valued, the peddler/tinker/money lender being largely restricted to people on the margins or even outside of society (Gypsies/Roma, Jews, Irish Travellers, in ancient times Greeks and Phoenicians). The ascent of the merchant from its former position outside and/or below the social structure to be ultimately assmililated within that structure and largely between the farmer/artisan and the warrior/aristocrat happened at different paces in different places, for example in Rome you had a distinction between the Senatorial class, the Knights (Equites-originally a military class turned economic one) , and the People from early on while in England it was long understood that gentlemen did not engage in ‘Trade’. But the ultimate result of having the merchant class being elevated to the pinnacle of society and its chosen norms being established as natural ‘Laws of Economics’ to some degree flies in the face of the history of society, the notion that everyone is born with an abacus or calculator in his head busily calculating ROI in the face of all variations is I think rather foreign to human nature as we see that expressed over the last few millennia and longer. So if we take this cursory historical model and apply it to income taxes what do we see? Interestingly we see a model flipped on its head, rather than being a burden on capitalism, an income tax ends up incentivizing it. But beyond the concept that taxes on income means taxes on consumption means an incentive to boost income to maintain consumption, there are some further wrinkles to explain why higher rates on income promote more economic input. Under our modern tax system, certain types of consumption are privileged over others. For example progressive tax rates and standard deductions are an explicit recognition that everyone has a right to some level of basic subsistence, which equally explains why we generally don’t tax groceries. On the other hand with sufficient progressivity in rates buying that classic Bugatti is going to cost you, in fact in 1958 it would have cost you 10X its sale price if measured in pre-tax income. On the other hand the tax rates were set up in such a way that you could shelter much of that income from taxes if you spent (invested) it in forms that could plausibly be shown to boost productivity overall. Now some of this simply ended up with tax avoidance of various types as consumption simply got shifted to the company ledger (the infamous ‘Unlimited Expense Account’ ) but it did provide incentives for companies to reinvest gains rather than distribute them in the form of salaries which would then be exposed to high effective taxes when converted to consumption. In this model decreases in top rates meant increased pressure for management to expand compensation to take advantage of the reduced tax bite. On the flip side it meant that for any given employee maintaining the same level of consumption meant less work rather than more, or perhaps simply more consumption for the same amount of work. A model that starts from the standpoint of consumption rather than accumulation as such is a much better fit for the actual social and economic history of the last half-century. As consumption taxes in the form of high marginal rates came down, the tendency of consumption and particularly conspicuous consumption went up. With the result that certain wealthy people couldn’t tell you off the top of their heads how many houses they owned, and Ken Lay thought it reasonable to have multiple mansions in the same ski resort. Both in the 80s and in the 00’s there was a huge boost in the size and extravagence of upper income spending where Supply Side insisted that the reaction should have been in the direction of greater investment. and increasing productivity. This shouldn’t be a surprise to anyone, look around the world and ask yourself what has historically been the response of ultra-wealthy people who among other things are not exposed to tax: Buckingham Palace, Versailles, the Forbidden City, the Taj Majal, Nero’s Domus Aurea. The ultimate fallacy of Supply Side is first to imagine that everyone has the temperment of a 19th century British Factory owner or Dutch Burgher intent beyond all on boosting the asset line in the ledger (though neither held back from consumption as such) and second to confuse a tax on income for a tax on work. In Psupply-pside psychology the most rational man in the world, the epitome of Humanity is Ebeneezer Scrooge, Esq, a man so desperate to keep every stray farthing in his Okun Bucket that he would cut himself away from the world of consumption and leisure. If England had had an income tax in Scrooge’s time you might well see him cut back on his business rather than paying an extra pound to the Crown in tax. But then most of us are not sociopaths. Taxes raise the marginal cost of exposed consumption and so decrease it leaving more income for reinvestment. Psychologically a lot more plausible than the idea that returning to Clinton or Reagan area rates means all the billionaires to go Galt on us. They seem to like their consumption where it is and can be expected to work to maintain it. Yesterday, run75441 sent an e-mail to the Bears touching off a bit of a discussion on the perennial question of what constitutes the “middle class” or a “middle-class income.” Run’s touchstone was the AMT, which has been turned by bad legislation (not indexing the zero bracket; interactions with the Bush-era changes to the ordinary income tax) and 40 years of inflation into something that “requires” — in the sense of avoiding the actual or perceived political catastrophe of raising taxes on a (fairly) large number of (mostly) upper-middle income taxpayers with high propensities to vote — annual patches to keep it mainly an upper-upper-middle-income tax. While there are horror stories about middle-income taxpayers with unusual circumstances being hit with AMT (e.g. due to exceptional numbers of exemptions for dependents), the patches mainly serve to keep AMT off the backs of low-six-figure earners who, despite being relatively well-to-do, nevertheless don’t have sufficient income to be in line for tax increases under Obamanomics. I’ve viewed the $200K or $250K-ish threshold for who’s rich enough to be subject to so much as the statutory income-tax rates of the 1990s as a mutant offspring of behavioral economics and tax politics. It’s a figure that happens to be enough money that people who will never make $100K (but don’t know it) won’t worry that raised upper-income taxes will affect themselves, or something like that. Based on criteria such as ability to pay without major hardship, I’m with Felix Salmon that the boundary of the “rich” is being set too high. Starting with the $200-500K category, the share of earnings from labor begins a marked decline. By the time you hit mid-six figures, average earnings from income, dividends, and capital gains become high enough to provide middle-class or better incomes without (necessarily) working. Tax returns in the upper-six-figure bucket, on average, show more income from other sources collectively than from salaries, and at the top of the income scale even interest and dividend income exceeds wages and salaries. (**) I suggest that if you can provide yourself with a better-than-average living without working, a very rare luxury indeed, you are in fact rich. (*) That some of the shares sum to more than 100 percent is not an error. 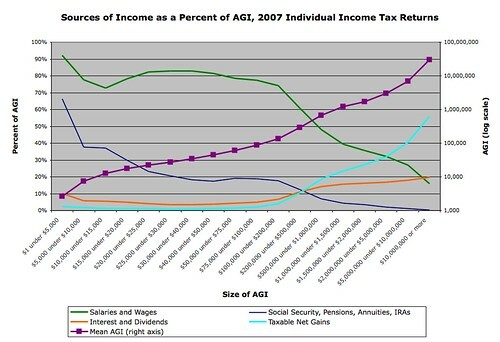 Some sources of income, notably nontaxable Social Security benefits, are not part of AGI. If average incomes by bracket are not plotted on a log scale, that line looks like everyone except the super-rich makes nothing. (**) Moreover, high-earners are negligibly dependent on Social Security and pensions for retirement income, in case anyone wonders about the origins of the long-running war on social insurance. One of my big gripes (in case you haven’t noticed) is the ease with which ordinary Americans can be fooled about tax issues by organizations, often ones with greedy purposes of furthering their own interests in lower taxes for themselves, that publish misleading or downright untruthful information and just keep repeating it. This has been a special problem with estate taxes, which hit only the very wealthiest amongst us and for a relatively small amount even for the large estates. It is also true of income taxes in general, the way flat taxes would work, the rationales for the corporate tax and many other key tax policies. Lobbyists frame the issues with inflammatory language, and most are too unknowing about the way tax really works to recognize the ruse for what it is. Here are two of my pet peeves. (Many tax practitioners–and lots of tax academics–disagree with me on these.) Some of the worst phrases that have furthered the cause of cutting taxes for the wealthy so that the majority of Americans can either pay higher taxes themselves or do without the kinds of things that governments, not private enterprises, do best are “death taxes” and “double taxation” . Much of the estate that is taxed when a decendent passes it along to his heirs as an unearned windfall has never been taxed at all during the decedent’s lifetime, in the case of wealthy people with mostly financial assets. If there is not a good-sized bite out of the estate upon the transfer to beneficiaries, there’ll be very little contribution to taxes from an agglomeration of wealth that has benefited enormously from the US legal system. And the heirs won’t have any taxes to pay either–they’ll just keep holding or will have a stepped up basis when they sell. All that is is a system for perpetuating or creating oligarchy–letting the wealthy become a ruling class with all the money and all the power without contributing anything much to help pay for the system that made all the wealth possible in the first place. Of course, even for those who don’t pay much attention to the various organizations that are peddling particular views of tax issues and haven’t been particularly swayed by the push for repeal of the”death tax” or repeal of “double taxation”, there is a huge gap in information that isn’t filled in by the media. Most schools, for example, don’t teach much of anything about the tax system in the basic civics course. Most students don’t take a finance course in college, much less a course that teaches the basics of tax law. In fact, most law schools don’t even require that their graduates have a basic course in federal income tax law before graduating. (That is a major problem, I think, since almost every legal issue has tax consequences, one way or another, that a competent attorney should be aware of.) As a result, we are frighteningly ignorant, as a society, about how tax works, why it works that way, and what other possibilities there are. And as a consequence of that ignorance, it is all too easy for citizens to be in the dark about the consequences of tax legislation under discussions, for lobbyists to influence members of Congress to vote in their favor on bills (the public won’t know the difference), and for members of Congress to fail to fully inform their constituents about the tax issues they are voting on (or even, in far too many cases, for the members of Congress to understand, as when a certain person from Colorado supported windfalls in the agricultural bill based on his apparent failure to understand the difference between gross income (revenues without business or other deductions) and adjusted gross income (revenues with business deductions taken into account)). So I’m glad to see Marjorie Kornhauser’s project take off. Maybe others won’t agree with me on these pet peeves, but if we have better educated citizens who have more basic knowledge about taxes and how they work, it won’t be so easy to bamboozle them into voting against their interest to support tax cuts for the wealthy and service cuts for everybody else while the boondoggles for the big corporations just keep pouring out (like an agreement that the government can’t use its bargaining power to get cheaper drugs, or that Big Pharm can prevent generics being sold for 12 years and other crap that is getting put into the “health reform” bill that is becoming, like so much else these days, a corporate giveaway). What’s her project? It’s called The Tax Literacy Project–“a non-partisan effort to informally educate the public about taxes through popular methods such as web-based games and other internet activities. Want to help? Donations are being accepted. What follows is the appeal, direct from Kornhauser and the ASU Foundation. Money from Taxes Helps Every Person Every Day! But polls show most of us do not understand anything about our taxes. Tax ignorance costs each of us money. Many of us pay more tax than we actually owe. Because tax ignorance makes it hard to discuss and enact sound tax policies, we are not able to raise money in the fairest and most efficient manner possible. Why do we need taxes? Taxes support democracy. They fund government services and goods such as court systems and national defense that protect your life, your property, and your constitutional rights. Taxes support economic growth. Governments use taxes to encourage economic growth in numerous ways such as maintaining a stable currency, enacting and enforcing laws that protect both workers and employers (their lives and proeprty), and helping to build and maintain large and dependable energy, transportation and communication systems. Taxes support your daily quality of life. They help you and your family buy a house, breathe clean air, have safe food and drugs, travel safely and efficiently on highways, trains and planes. Taxes help pay for your health care (in the form of tax benefits or direct care) and they pay to educate you and your family. Taxes help you at work (e.g., enforce contracts, provide a safe workplace) and help you at play (e.g., national parks). Become a part of a solution to the problem of tax ignorance by contributing to the Tax Literacy Project. What is the Tax Literacy Project? It is a non-partisan effort to informally educate the public about taxes through popular methods such as web-based games and other internet activities. Can you support the Tax Literacy Project regardless of your political outlook? Yes, the Project’s only pupose is to help provide information about tax, not to support any particular type or amount of taxes. No matter what kind of government people want, that government will cost money. Americans must understand how that money can be fairly and efficiently raised. How can you make a charitable contribution? Make your donation payable to the Tax Literacy Fund at https://secure.asufoundation.org/giving/online-gift.asp?fid=418 (no appeal code necessary) or Make your check payable to the ASU Foundation and mail to the Sandra Day O’Connor College of Law, Arizona State University, PO Box 877906, Tempe, AZ 85287-7906. Please write Tax Literacy Fund (3000 4788) in the memo line of your check. Thank you in advance for your support. Please contact the project director: Marjorie E. Kornhauser, Professor of Law, Sandra Day O’Connor College of Law, Arizona State University, Marjorie.kornhauser@asu.edu, 480.965.0396. All funds will be deposited with the ASU Foundation, a separate non-profit organization that exists to support ASU. YOur payment may be considered a charitable contribution. Please consult your tax advisor regarding the deductibility of charitable contributions. Define rich. Define rich! Define rich? Fine. I’ll accept the challenge. But, first understand that I accept the challenge because having a definition of “rich” is needed if we are going to fix the money from money economy. We have to ask: When is enough, enough? We have to take the responsibility of having determined what enough is, if we are going to return to the ideal of our democracy. The ideal of equality of power. This ideal was discussed in my postings (3 of them) on taxation. I think this nation used to know when enough was enough. We used to know what rich was. It was a life; as in “pick a life, not a job”. It was an ability made capable by the amount of money managed (not flowing) through one’s hands. That it was a life meant we did not fall for the rhetorical trick of: Define rich! I dare ya. The trick is that the question is asked in reference to defining levels of income at which a specified percentage of taxation will take place. It is the infamous black and white trap when we all know we live in a life that is the spectrum of color. Cross this line you pay, don’t cross it, then you don’t pay. As with all dares, there is a threat. The threat for the rhetorical “define rich” dare is that the moment a number is chosen, the one doing the daring will retort with a life example of the chosen number that under the life circumstances retort might not be considered rich. Even the rich knew what rich was. Let me say, for me wealth is not the rich I’m talking about. Wealth is another issue that should not be brought into the discussion of “rich” related to an income tax. It get’s thrown in as another rhetorical trick, the trick being that one will think about a dollar amount of wealth and then think how much money it took to get that wealth ala income. But, wealth is accounted under the asset category, not income. Really? Thirty 37 million members world wide on a planet of 6 billion is not exclusive? $61,000 of assets should make us all feel rich? The message (and I am not interpreting that Profressor Mankiw’s posting suggests any qualification) is that we should all feel equally wealthy and thus rich. Can you see how such a presentation could be used as a rhetorical trap in determining “rich”. So, let’s not go there. “There” is for the discussion of the estate tax. Besides, once the income has been turned into an asset, it’s kind of too late to worry about taxing the income. No? Also, we are talking the United States of America. Not Zimbabwe. (See the above issue.) I know there are children starving in Africa. We have the same here, it’s just that the income needed here to not have a child starving is higher. Purchasing power parity and all that. Though, if we would be adult about the issue of “rich” and define when enough is enough, we would be able to do more for such people as there would be more left for them. Wealth confers power beyond its consumption value. This power is economic, social, and political. The economic power of the rich derives primarily from their ability to use their wealth to invest in enterprises that employ thousands of people and can dominate large sectors of the economy. Yes, they are talking wealth. However, as I noted, this is after the rich bought their stuff to make them happy. Now they are just accumulating power. We need to define “rich”. We need to be adult about this and take the responsibility for understanding the interplay of society and an economy within our form of democratic governance. Personally, I think we will find that defining rich for our purposes is rather easy once we stop answering the rhetorical dare of: Define rich? For this discussion “rich” is a life classification. The classification is consumption determined, the amount of which is a function of energy expended (ie: physical labor/intellectual labor), work performed (ie: blue collar/white collar) along with energy conserved (freedom), work diverted (power). This aspect of life is not about what the individual finds satisfying. That is another rhetorical trap. We all know of those who are fine with just hitch hiking through the galaxy and would consider them self rich for the memories. The life aspect needed for determining “rich” for the purpose of taxing is the aspect determined by the structure of the society one lives in. For us, that structure is idealized in the phrase: The American Dream. That phrase is the socially understood goal and that phrase is underscored by how much money your hands manage. Classification as in “class warfare”. Consumption as in “autonomous consumption”. American Dream as in more than autonomous consumption. All three a function of the amount of money managed by one’s hands.